100% natural compost made from local, organic materials - the permaculture way! Our handemade compost is created using natural resources collected in the Lake of the Ozarks. Absolutely no chemicals or fertilizers are used. Ingredients include leaves, grass, straw, hay, cow manure, chicken manure, horse manure, old depleted soils, wood shavings, vegetable bioproducts, and more. Every pile is thermophilic and "cooked" to 140˚ - 160˚ F to ensure the greatest protection against wild seeds and pathogens. A portion of each batch is used on our personal homestead to ensure the highest quality, care, and attention is given. New batches nearing completion, would you like to be notified when available? 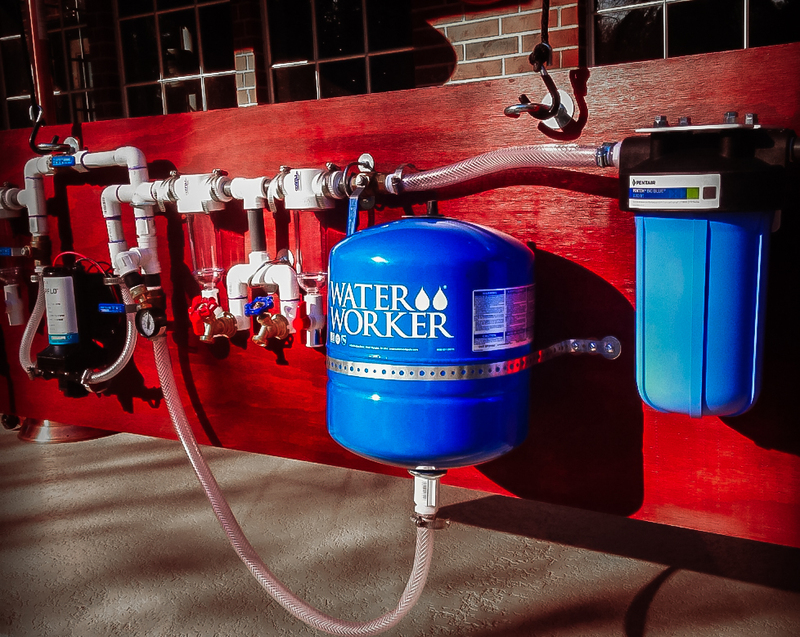 A Water Filtration Hub (WFH) is the perfect setup for anyone interested in a complete off-grid water system. It is a combination of reverse osmosis filtering, pumps, pressurizers, switches and plumbing fixtures. While designed specifically for rainwater treatment, the applications are limited only by your imagination. By applying reverse osmosis in a carefully segmented sequence, water is purified while the lifespan of your filters are maximized. The WFH is also a great line-of-defense against many of the unwanted trace elements coming in from the water grid. The WFH can be customized to suite your specific needs including GPM, PSI, AC/DC, voltage, physical dimensions, portability, and color. Each setup is hand built here at Ozark Permaculture. Construction begins as soon as all parts arrive from the manufacturer. Afterwards, please allow approximately 1-2 weeks to build and test before shipping. Disclaimer: No warranties or gaurantees are provided beyond what the original manufacturers provide. Certain chemicals, such as chlorine and total trihalomethane, will not be filtered using a WFH. Do not catch rainwater off of asphalt tiles or any other potentially harmful surfaces. Do not use or consume filtered water without first submitting to a certified institution for comprehensive testing. All water sources may vary, Ozark Permaculture is not responsible for how you choose to use your WFH.